Opera releases are always worth a look. It's the testing ground for new features - and a preview of what Mozilla's Firefox and Chrome will implement in about three years' time. Here's a quick hands-on with the Mac version. Before you even run the alpha, the engineering quality is evident. 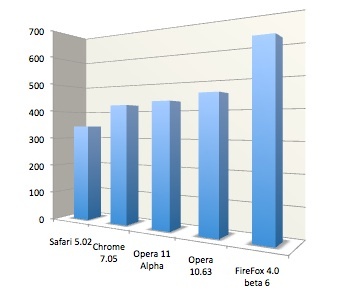 While the Firefox 4.0 beta weighs in at 64.2MB, the Opera 11 alpha tips the scales at 34.4MB. Opera contains far more browser functionality as well as having an excellent email client built-in. Regular users may notice a couple of tweaks. The Personal Bar is now called the Bookmarks Bar, but I noticed that it's populated with the default Bookmarks, even after you've moved them to the Trash. (This is an Alpha, remember). The Bookmarks Bar is off by default. And what's Kayak, anyway? When lots of tabs are loaded in a window, the tabs now hide their close button until activated. Windows and Linux users are familiar with a similar behaviour in those versions of Opera. The button doesn't appear if the mouse hovers over the tab, however. The appearance and placement of the button depends on the theme. There's a very welcome new option to leave Flash plug-ins inactive as web pages load. It's turned off by default. Google Chrome squeaks in ahead with a benchmark of 419.6ms. The current version of Opera beats Chrome in crypto, maths and 3D categories. Chrome makes up the difference in the string and date benchmarks. But we're talking small amounts, smaller than the confidence interval and overall; there's very little between Opera and Chrome. SunSpider benchmarks on a relatively old machine.